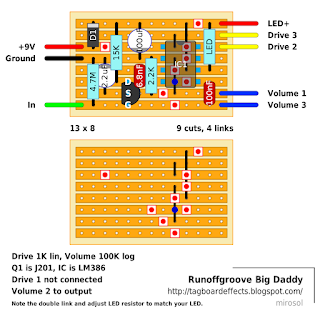 Continuing Grace Overdrive article at ROG: During the testing of this circuit design (meaning the Grace Overdrive), the thought occurred to try a Jfet gain stage before the 386, instead of the buffer. The impedance would still be high and the 386 would see more signal and clip harder. The result is a pleasing grind and responsive big amp-like distortion. The gain control functions in the same way, but the range is higher in gain. Pretty effective, considering that if you want to use a gain stage, you probably don't want the semi-clean settings of the buffered version. So here's the Big Daddy. Basically, Grace with a gain stage instead of buffer at the input. There was a discussion about this on the TechXchange forum the other day: http://www.digikey.com/techxchange/message/6310. Your circuit design would be a perfect addition to the conversation. Thank you for sharing! I'm not sure if verified or not. I've uilt it but i just get a small boost controlled by both pots, maybe it is because i used a mpf102. I´ll try it with other jfets. It should be loud... And i'm not aware if anyone else has built this, but the changes between this and Grace are pretty minor. 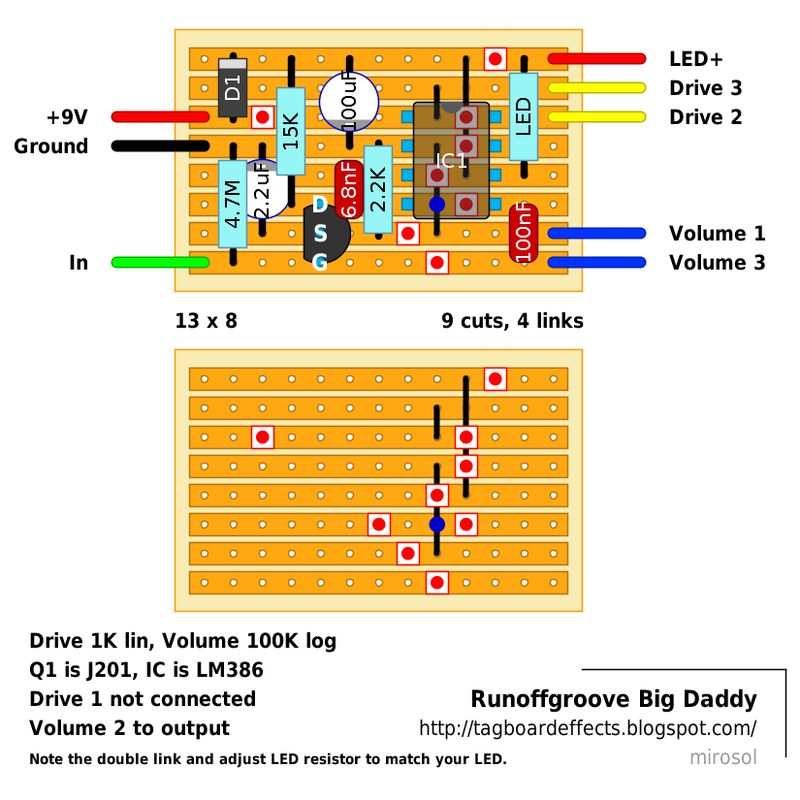 I just checked the schematic, and i'm pretty confident that the layout is correct.. Built it. And it is Loud with a captial L. And not bad little circuit. I'd still recommend the switchable "Big Grace" to get the best of both versions in one box. What Diode do you use in D1? That's series polarity protection, so any will do. But for low voltage drop you'd want 1N5817.